The drug-smuggling semi-submersible makes its first public appearance in the Caribbean Sea. In 2006, the first homemade drug-trafficking submersible to be seen at sea by American law enforcement officers was interdicted 100 miles off the Pacific shore of Costa Rica, carrying 3 tons of cocaine. 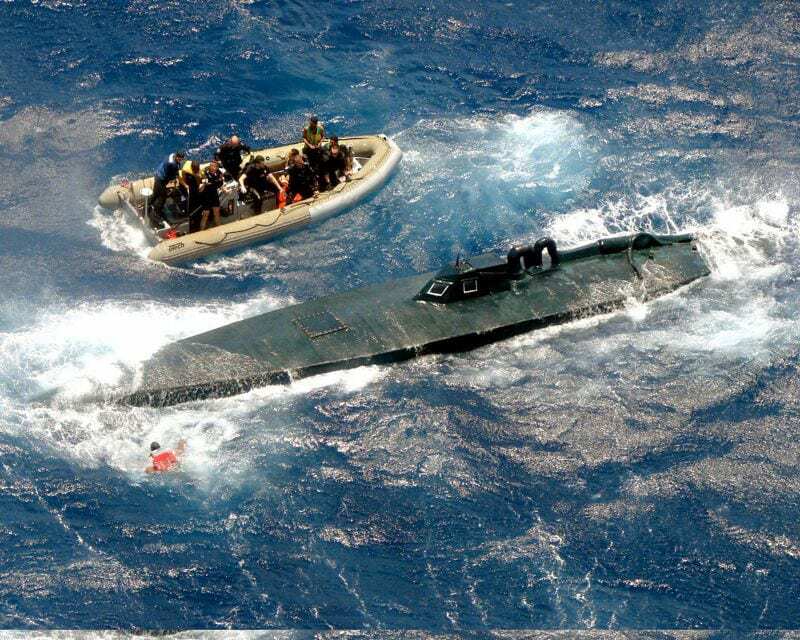 Ever since, these stealth vehicles, sometimes called “narco subs,” but more properly known as self-propelled semi-submersibles (SPSSs), have been intercepted periodically throughout the vast eastern Pacific expanse of the “transit zone” – the 42-million-square-mile area comprising the drug trade’s maritime approaches to the United States from Central and South America that also includes the waters of the Caribbean Sea and Gulf of Mexico. The SPSS is a sophisticated tool for drug smugglers, but as far as submarines go, it’s actually fairly crude. None of the vessels captured at sea so far is capable of submerging fully; their crews (usually about four or five people) must have access to outside air. Typically about 30 to 100 feet in length, some can carry more than a dozen tons of cocaine. Crude or not, the SPSS has proved maddeningly difficult to intercept. It rides low, often with just a pilothouse above the waterline, making it virtually undetectable by radar. The upper hull is colored to match the ocean’s surface, making it difficult to spot by air, and many SPSSs have moved their exhaust ports to their undersides, making them invisible to infrared sensors. The SPSS is also designed specifically to be sunk before it can be boarded by law enforcement officers, with scuttling valves that send the vessel and its cargo to the bottom of the ocean and allow the crew to float free. Despite 25 Pacific interdictions in recent years, there had been no submersibles sighted on the Caribbean/Gulf of Mexico side of the Central American isthmus – until last summer. On July 13, 2011, the CGC Seneca, a medium endurance cutter, interdicted an SPSS that had been spotted off the coast of Honduras by a patrolling C-130 Hercules aircraft. The submersible was scuttled and its crew rescued before its cargo could be recovered. According to Capt. Brendan McPherson, chief of enforcement for the Coast Guard’s 7th District, the scuttling strategy that had proven so effective in the deep waters of the Pacific proved less so over the extensive Caribbean continental shelf of Central America – where in some places, the water remains relatively shallow even 100 miles offshore. Detecting and interdicting drug-smuggling ventures in the region is a shared responsibility among the 7th District and Joint Interagency Task Force South (JIATF South) – an organization established in 1989 explicitly for the purpose of countering illicit drug-trafficking operations. Commanded by Coast Guard Rear Adm. Charles D. Michel and headquartered in Key West, Fla., the task force brings together counter-drug experts from regional partner nations and the departments of Defense, Justice, and Homeland Security to track and monitor drug shipment throughout the region. As a federal law enforcement agency, the Coast Guard is responsible for interdicting and apprehending these suspected drug shipments. The Coast Guard led an interagency effort to recover the drugs in an operation dubbed “Op Treasure Chest,” with the support of several Coast Guard cutters, the Honduran navy, and dive teams from the Federal Bureau of Investigation (FBI). The submersible was located by the crew of the CGC Oak on July 26 using side-scanning sonar, and the FBI Laboratory’s Technical Dive Team from Quantico, Va., recovering more than 14,000 pounds of cocaine, worth an estimated street value of $169 million. The ensuing months demonstrated that this first interdiction was no aberration. On Sept. 17, the CGC Mohawk was notified by a Coast Guard Hercules that they had spotted another suspicious vessel in the Western Caribbean, about 200 miles away from the cutter’s current position. The SPSS crew scuttled the submarine as the Mohawk’s smallboat and helicopter approached, but Coast Guard personnel were able to recover 8,820 pounds of cocaine before the submersible sank in deep waters. Just 13 days later, when the Mohawk intercepted another submersible 110 miles off the coast of Honduras, the task force was presented with another opportunity for shallow-water recovery of scuttled cargo. The CGC Cypress, with the FBI’s Technical Dive Team aboard, began searching for the submersible on Oct. 17, and found it two days later. Divers recovered 19,831 pounds of cocaine, worth an estimate street value of $238.3 million.